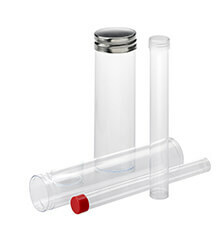 These round clear plastic threaded tubes are made of three components, beginning with a clear tube that is put through a secondary process to add threads. A clear bottom disc is then permanently attached to create a clear container with a 360° view. Just select a threaded cap from two styles, one metal and one plastic, and the plastic threaded tube packaging container is ready to show off and protect your product. All dimensions are approximate. Manufacturing tolerances are available upon request. We do not stock this product. Each order is produced to the length requested. To order this product, please call our toll free number or send an email to customerservice@visipak.com.